March 14th is Pi Day for math geeks enthusiasts everywhere. Maybe this number isn't used much in bookbinding, but math in bookbinding is certainly unavoidable so Pi Day deserves some recognition! 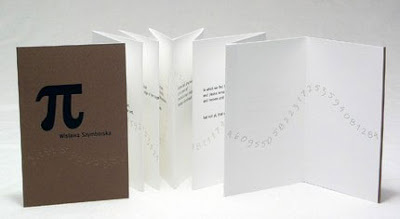 And here we have, Pi, a letterpress printed artist's book by Susan Angebranndt of GreenChairPress. You can read about Susan's book and the poem by Wislawa Szymborska's by visiting GreenChairPress.Etsy.com.